Some of the Best Sights to See Can’t Be Accessed By Foot. Kauai is a dramatic and lush paradise, with waterfalls and mountains lining its coast. It is the oldest and one of the largest islands in the Hawaiian chain, because of this there is some diverse plant life…all in one place. Waimea Canyon is arguably the most popular and picturesque attractions in the world. 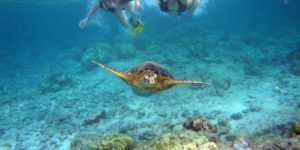 You may have found that Oahu focuses on urban entertainment and cultural attraction, Kauai is purely the land of adventure. Some of these include trips through the ocean just to witness the Na Pali Cliffs or helicopter flights to the gorgeous golden beaches. 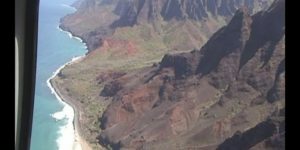 The island of Kauai can be toured in two full days: one day devoted to scenic sites that are located to the west of Lihue which curves up to Waimea Canyon. A second day can be spent on the road, which runs to the northern coast. That being said, most visitors spend more than just two days in Kauai. After all, the allure and spectacular adventure cannot possibly end in that short a matter of time. Most of these places are inaccessible by foot, and are dangerous if you try to hike to them without experienced guides. You’ll need either a helicopter tour, or you can go out on a boat trip. Both will cost roughly upwards of $50, but you can always use an expedia promo code (we linked to a website that gives them out), to get these tours for cheap. This state park surrounds a remote area of Kauai with dramatic mountain scenery that has waterfalls, cliffs, and incredibly lush vegetation. The Na Pali coast in the Northwest region of the island is one of the non-accessible parts of Kauai. The series of mountains, some of them going as up as 3938 ft, have a slope that plunges directly into the ocean. The beauty of it all can only be appreciated either from the water or from air. On the land-side are the incredibly steep valleys that divide the mountain crests. Plus, thanks to this seclusion, the place also boasts of a unique range of vegetation, which when together with the aesthetics of steep hills, waterfalls, caves, and mountains, makes for an intense layer of greenery on its own, and also leads to the sandy beach. The best way to survey this area is by simply taking a tour via helicopter, or taking a boat around the coastline. Both of the choices offer excellent experience for the tourists. 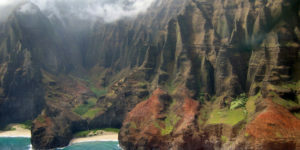 For more info on The Na Pali Coast, click here. This place stands as one of the most beautifully scenic canyons on the planet. It is deep with red soil, lush green jungles with a line of streams and waterfalls. And to top that, you might be captured by the view of black volcanic rocks behind a blanket of mist. Waimea Canyon has two main lookouts and some hiking trails that begin from the road along the rim. View the State Parks website for more info on Waimea Canyon. The Koke State Park is an extension of the Waimea Canyon and is referred to as the deepest part of the entire canyon. An interesting spot is the Kalalau Lookout which is said to provide a view of cliffs that rise over 4000 ft. along the Na Pali coast. This is the only place that you are able to see along the spectacular feature of the Kauai if you are on land. The cliffs are mostly always clouded with mist and the lookout is at the end of the road running through the park. Koke maintains have numerous hiking trails, most of which are spread out from the Koke’e lodge and natural history museum. The Museum concentrates on the botany, wildlife, weather, and geology connected to the Waimea Canyon. This waterfall lies in a scenic place itself. The double waterfall extends 80 feet downwards from a rock face. Folklore mentions how the chiefs of Hawaii had to take the risk of jumping from the top and prove their courage and strength. The state park is situated at the western end of the Na Pali Coast. From afar, you may not notice it covered in some greenery. The coast also has white sand beach and despite the beauty of it, all tourists are advised to always take caution as this remote beach area can be dangerous. This place is located around the sunny south coast of the island where also Kauai’s finest beaches are said to be at. One urban development regulation states does not let buildings there to be more than three stories high, in order to preserve Poipu’s rural character. Copyright © 2019 Air Kauai.